For anyone selling a home, the open house is one of the most standard—and most dreaded—rituals in the process of attracting buyers. While many sellers and some realtors feel that open houses are more effective at reeling in nosy neighbors than serious buyers, there is no doubt that they help generate interest and drive traffic to your home. Therefore, if you are committed to finding a buyer, it may be worthwhile to endure the hassle of hosting a few open houses. Do: let the light in. Creating a “bright and airy” look for your home will help buyers view it as more spacious, so open the blinds and turn on some lights. Strategically placed decorative lamps and accent lighting can be used to highlight your home’s best features. Don't: overwhelm buyers’ senses. Many homeowners think that playing music, baking cookies, or placing air fresheners around the house will create an appealing ambience. On the contrary, such measures are distracting and can make buyers worry that the home has undesirable features that are being concealed—such as road noise or pet odors. The best way to ensure that your home has a pleasant scent is to thoroughly clean before the open house (but be sure to not leave behind a strong aroma of cleaning products). Do: clear the countertops. An easy way to make your home appear larger is by removing nearly all personal and decorative items from the countertops in your kitchen and bathrooms. Potential buyers will be impressed by your home’s storage space and will more easily be able to envision their own belongings on those surfaces. Don't: forget to remove valuable or private items or papers. For your own safety, it is important to remember that an open house is just that—open. Anyone can stop by, including those with malicious intentions, and your realtor may be too distracted by interacting with potential buyers to monitor everyone. Therefore, it is important to remove anything that could be stolen, such as money, jewelry, or paperwork that contains your personal information. Consider storing these items in a safe or keeping them with you whenever an open house is underway. Do: take feedback into consideration. 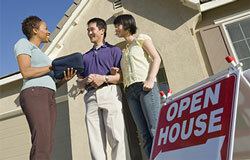 Your realtor will likely ask everyone who attends the open house what they thought of it. When he or she shares this information with you, try not to be defensive when it comes to negative feedback. If several people are deterred by the same thing—for example, the high price or something that needs repair—then you may risk losing other prospective buyers for the same reason. Discuss all feedback with your realtor and determine whether you need to make adjustments. Don't: stay. As curious as you may be about who is looking at your home, hovering around during an open house will make visitors uncomfortable and impede their ability to freely gauge what they do and do not like. When your home is on the market, have a designated place, like a local park or coffee shop, where you and your family can wait comfortably during open houses. One of many buyer programs available! Let's Do What Gets Ya Moving!